Five Sky Crystals fall to the Mushroom Kingdom and Mario finds one. He and his friends are invited to Bowser's Castle for a feast, but it was a trap. Bowser steals Mario's Sky Crystal and uses his Minimizer to shrink the heroes and send them far away so he can find the other four Crystals. Now Mario and friends must travel across the four game boards by rolling a dice and finding Coins and Stars. There are 74 minigames to play, including boss battles where you can win Sky Crystals. 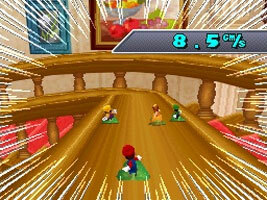 You can play with up to four players with local wireless single-cart multiplayer.